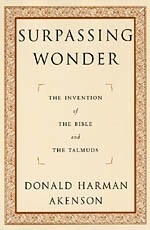 CCUCC BOOK GROUP—Our next book for reading/discussion is “Surpassing Wonder: The Invention of the Bible and The Talmuds”by Donald Harman Akenson. Everyone is invited to join in this study of one scholar’s understanding of how the scriptures of Christians and Jews came to be. We’ll begin on Tuesday, January 7th at 6:15pm at CCUCC. “Calling the Bible and Talmud ”inventions” may sound like fighting words to a religiously sensitive audience, but here the word ”invention” is a belief-neutral description of the processes that created the Jewish and Christian foundational classics (the Hebrew Bible, the Jewish literature of the Second Temple period, the New Testament, the Mishna and the Talmuds). In ”Surpassing Wonder,” Donald Harman Akenson, a professor of Irish history, adopts a Great Books approach to Jewish and Christian history, viewing it not as ”a chronicle of events, but a chronicle of successive texts, their constant invention and reinvention.” With an imaginative use of metaphors, analogies, persuasive rhetoric and praise, he pleads with all to read these religious classics seriously, whether they grant them spiritual authority or not, because, precisely as splendid intellectual and spiritual ”inventions,” they have fascinated readers for generations and profoundly shaped Western civilization.” –Anthony J. Saldarini, from The New York Times review of Surpassing Wonder, Dec. 13, 1998. We’ll begin on Tuesday, January 7, 2013. Need Us to Order a copy of "Surpassing Wonder" for You? (required) Yes!